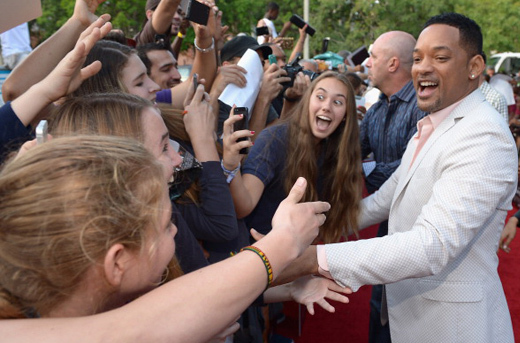 Yes, readers, our dear Will Smith habla un poco de Español! The After Earth star made his promotional rounds in Miami with son Jaden Smith to discuss their latest big-screen project. Smith chatted with our friends over at Fandango Cine in an almost all-Spanish interview about his time in Costa Rica, which he calls "pura vida." The father and son duo also stopped by Univision's Despierta America for a highly entertaining interview that included singing, dancing and a hilarious trivia session. Oh, one more thing. In case you missed this much needed Fresh Prince of Bel-Air reunion, here's DJ Jazzy Jeff, Smith and Alfonso Ribeiro jamming on Britain's Graham Norton Show to a few classics. After Earth hits theaters this weekend. Be sure to hit up Fandango’s Summer of Action special section for tickets, offers and more!